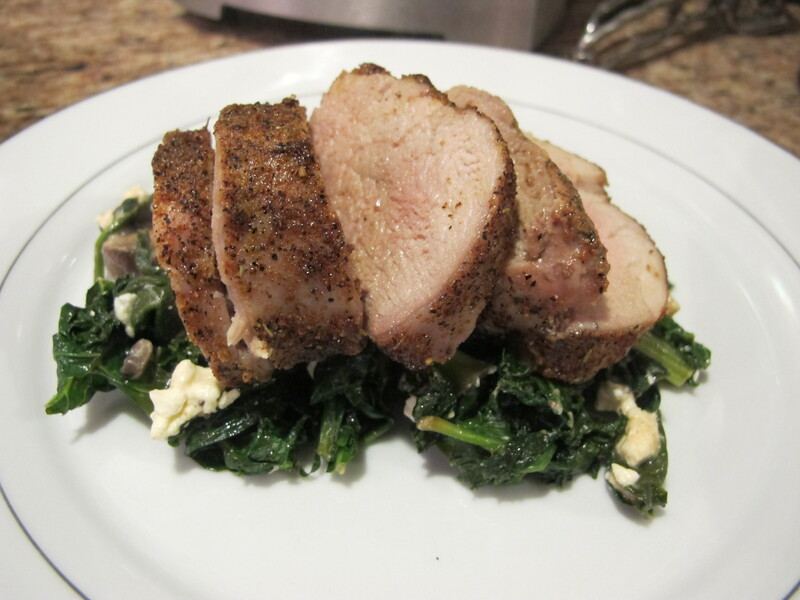 I always forget how easy pork tenderloin is, and with these quick cooking greens the whole meal is no trouble at all. This is warm and hearty for the winter without being particularly bad for you. Preheat oven to 450 degrees. Rub entire tenderloin with whatever spice rub you prefer, or just some salt and pepper. Drizzle with olive oil and put in oven for 30-40 minutes. In the meantime, sauté mushrooms in half of the lemon juice and a little olive oil until tender, set aside. Saute kale and spinach and the rest of the lemon juice and a little olive oil. Add back the mushrooms and the feta cheese, stirring gently to combine. Remove tenderloin from oven, tent with foil an rest for 5 minutes. Top greens with sliced tenderloin. Voila.